Two totally opposite feature films. Doing a marathon of two different styles of cinema is always a treat in my viewpoint. I love mixing up genera’s and making an afternoon or night of it. This time around one romantic comedy thriller and one suspense action thriller. Two films lovingly brought out on Special Edition Blu-ray’s by the one and only Twilight Time Company. Each have a pressing of 3,000 Units and each are amazing to have to this growing collection of films that Twilight Time chooses to bring out. First Up Who’ll Stop the Rain. 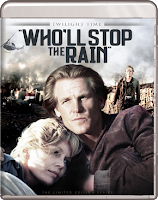 Who’ll Stop the Rain is about a journalist named John and a Vietnam Vet named Ray. Both are coming home from war. Both have really nothing to lose or going for them so they decide to create a scheme that details smuggling heroin from Vietnam and bringing it into the US. The goal, to make a fortune of money. But not all goes as planned as they soon become trapped in a cat and mouse game, fighting against drug dealers and the DEA. This star’s two amazing male actors that shine brightly in my viewpoint. Sadly, I don’t think they have ever gotten the stardom they deserved or at least that huge house hold name reality. I think both are two of the greatest actors. The extraordinary, amazing one of a kind performer Michael Moriarty. Moriarty is perfection in anything he does. I think he is an actor that truly owns, creates and makes you the viewer understand or become a part of the performance he is playing. He also was honored with another Twilight Time release to Special Edition 3,000 Unit Blu-ray 1973’s The Last Detail, which I reviewed and can be found in the Twilight Time section of the reviews. Next is the one and only Nick Nolte who needs no introduction, starring in well over 100 performances to date. My personal favorite role as Tom Wingo in 1991’s stunning, The Prince of Tides. Other films that I think are amazing and award worthy is 1992’s Lorenzo’s Oil and the remake of Cape Fear in 1991. Absolutely loved him in 1997’s Nightwatch. Both Moriarty and Nolte are perfection. Also starring the very beautiful Tuesday Weld. She is an award winning and nominated actress that creates every character into a believable persona, and the character of Marge in Who’ll Stop the Rain is no different. She also starred in another Twilight Time Special Edition release, playing the character of Sue in Pretty Poison. She has been a part of so many important films in cinematic history from Looking for Mr. Goodbar (1977), 1981’s Thief, to 1984’s Once Upon a Time in America. It was great seeing her in this film. Also starring the ever-wonderful Gail Strickland who in my viewpoint never has gotten the stardom or limelight she deserves. Mainly a Television actress, but also a feature film performer. Her character of Pauline in the movie Bound for Glory, is flawless and which might I add is also a Twilight Time Special Edition Release. She has also been honored with another Twilight Time release for the month of May’s 2017’s bundle of Blu-ray’s, The Man in the Moon where she plays the character of Marie Foster, like always to a golden ticket of perfection. In Who’ll Stop the Rain she plays the character of Charmian, also to a golden ticket of perfection. I love connecting all the Twilight Time releases in some sort of way and usually by the actors or actresses playing in the film is the easiest way. As of this writing Gail has been honored three times with Special Edition Releases from Twilight Time, Bound for Glory, The Man in the Moon and Who’ll Stop the Rain. Amazing like all her other work. She has a stardom to her. She can bring emotions to life and make you believe them through her many wonderful performances, no matter how small or big. Something else that needs to be mentioned is the wonderful writer of this complex film. Robert Stone was an amazing writer. Sadly, no longer with us but he left an amazing array of novels that should be sought out and read, and given the honor. Who’ll Stop the Rain is based on the novel Dog Soldiers. Another of his novels was adapted to a feature film A Hall of Mirrors which was retitled for the film WUSA. He was an awesome writer. I have read four of his books and all four where great. I have read Dog Soldiers, A Flag for Sunrise, Children of Light and Death of the Black-Haired Girl. If you’re a reader seek out his books. Directed by the great Karel Reisz. He was a director that knew what he wanted in a film and shinned once that film was complete. He is a director that many don’t know or his name is simply never brought up when it comes to great directors. He directed 9 movies and directed TV and documentaries. I personally think the few films he directed are worthy to stand out and praise. He also was a producer and writer. Really loved his 1966 film Morgan! His flawless biography drama 1968’s Isadora. Many will know him from his 1974 film The Gambler starring the flawless one of a kind James Caan. My favorite by him is the 1981’s The French Lieutenant’s Woman starring the amazing Meryl Streep and equally important Jeremy Irons. From drama, action, romance and everything in-between. He mastered many realities in film. Directed by Peter Yates. Yates was a director that could give a solid film. He had away with crafting his performers in a solid atmosphere that seemed real life on screen. The way he directed gave everyday life a starring role. He made his films come to life. From the amazing crime action film Bullitt to the over the top fantasy science fiction Krull; he gave something fresh and unique to his films. He most promising and most memorable film is Breaking Away, which is one of those shinning experiences of film brilliance. Breaking Away was honored with a special edition Blu-ray by Twilight Time also, and you can read my review for it in the Twilight Time section of reviews. 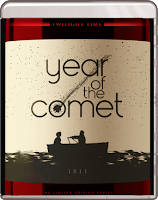 The plot to Year of the Comet is Margaret happens to be a young wine expert. She is the daughter to Sir Mason Harwood. Harwood decides to sell a very rare and expensive bottle of wine to a collector in the South of France. He hires Oliver to get her there safely. But what they don’t know is a scientist named Philippe wants that bottle and is willing to do anything and everything to steal it. So, begins an adventure of chases, explosions and all kinds of mishaps. Both Penelope Ann Miller and Tim Daly play off each other in wonderful ways. The chemistry works and makes the movie flow with ease. Two films to enjoy on High quality, high definition 1080p clarity. Twilight Time has done it again in bringing two films to two new outlets. A wonderful double feature. Isolated Music Track: For the music in Who’ll Stop the Rain is done by none other than music master Laurence Rosenthal. A composer, arranger, conductor of feature films and TV cinema. Was nominated for two Academy Awards for his career in films 1964’s Becket and 1972’s Man of La Mancha. Winner of 7 Emmy Awards and nominated for 13. And nominated for 2 Golden Globes. That should showcase his brilliance in the music world. One of my favorites he composed was for the 1981 Fantasy classic, Clash of the Titans. He also composed for one of my favorite made for TV films a killer crime horror film that sadly has been lost by time and that deserves a special edition release, the one and only 1985’s Blackout starring Keith Carradine in an amazing, scary performance. I wish someone would bring this film out. Composing well over 130 Movies and TV projects. Not to mention all the work in the music department. It was great hearing this isolated reality. Truly always a wonderful special feature that Twilight Time provides. Isolated Music Track. The music is done by composer Hummie Mann. Another wonderful special feature, always brilliant hearing the isolated score to a film. Mann has worked on well over 50 films in the Composer, music or sound department. A wide variety of films, comedies, dramas, horror’s, B-movies and Big Budget movies. His talent and career is a vast array of cinema. Wonderful hearing his talent on this special feature. Yet again two priceless examples of how to treat film. Wonderful transfers. High quality sound and picture quality. Twilight Time has aced yet again two wonderful and amazing Blu-ray's to own, praise and collect. Highly recommended.